What is the most simple airborne wind energy architecture? nah, Too many steps, mechanical to electric in the air and then transfer to ground…is too hard to sustain weight and dependant on massive lift - no scalability. Also needs torque compensation aloft. Risks line strike and tangle. I believe a simple Yoyo with a rigid kite is among the simpler. Yoyo solar balloon… or that’s not wind energy… then a kite being dragged downwind attached to a generator. @tallakt you’re right we need to define simple. Not needing a controller, or any software would be a start. No yo-yo would survive that metric. That’s a yo-yo with the age old question… How long is a piece of string? Not a yo-yo, but only a yo. If the task is to do work then have a kite drag or lift a weight. That’s pretty darn simple.^^ Useful? No. But simple. So simple in this matter would imply using passive, unpowered kites. That leaves just a few options I guess. We have the daisy which is quite good. I would say an oscillating kite with energy absorbtion on the ground is the simplest you could get. 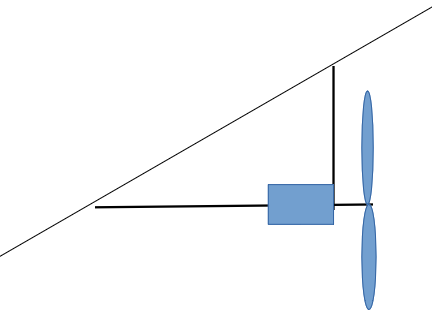 For instance an oscillating kite mounted on a flywheel rotating at the oscillation frequency of the kite. Even simpler than daisy, as the simplest solution will probably only have one kite. Yep, it’s a ribbon with a bearing either end. Spins really fast but so little torque. Surges the anchor tension rapidly too. If you don’t bother with a backstop line… Daisy changes with the wind no problem. I think the practicable Daisy torque tube scaling length is a lot longer than most AWES folks imagine. I have no idea what it is. Small rinfs with short gaps have proven an extremely lightweight long shaft can handle power well. However we don’t need that length as you can just start adding kite rings instead. Rod, what kind of propeller you had during that test up there? What rope did you use? 2 lines? What’s makes it not feasible according to you? How many more skybows could you stick on a pair of lift kite lines? Can you modularly add lifters and skybow arches at the same time to a 2 side line curtain of wind energy capture? Some details are on the attachment below. Basically what I want to do with lifters with pitch control instead of parachutes. Their description and the groundstation design is overly complicated. Seems like they like to display things as complicated, can’t think of any other reason why they would include a drawing of planetary gears. The parachute can be simple. But the groundstation is overly complicated as you mention. Basically a playsail is a rectangle connected by a tether in each corner. So it can be a current tarp with eyelets. In the the first video the two lower corners are close, perhaps in order to improve some aerodynamic features and the elevation angle. Yoyo method can be used. It is difficult to make a less expensive and complex airborne wind energy system. Can be it efficient and safe enough? What kite plans do you like?